Raaga.com: Aamir Khan meets his idol! Aamir Khan with his array of super hit films like 3 IDIOTS, DHOOM 3, LAGAAN etc has not only fans in India but has fans around the globe. However any guesses whom does Aamir Khan adores? Well the secret was recently revealed when Mr. Perfectionist aka Aamir Khan was left awestruck when he met Hollywood’s superstar and Mr. Universe Arnold Schwarzenegger at summit in New Delhi. 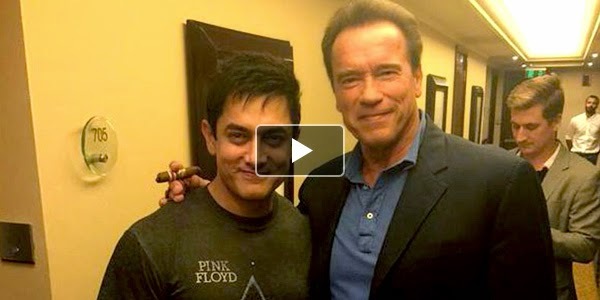 Aamir Khan in his tweet revealed that he was in New Delhi for HT Summit but when he came to know that Arnold Schwarzenegger is also present for the summit he requested the HT officials to give him a chance to meet him.